At this point I am sick and tired of canning, blanching and freezing, and cleaning the kitchen afterwards. There is still a good amount of crops in the garden: lettuce, arugula, beets, spinach, radishes, kale, collard greens, and carrots, not to forget the jalapeño plant, almost a bush by now that just won’t stop producing. Yet most of the fall harvest will not require lengthy and messy processing. The sight of the filled freezer and the line-up of jars with jam, jelly, chutney, relish and other preserves is utterly satisfying. Like a squirrel, I have packed away as much as I can for the winter. Thanks to the generator we finally installed, this is the first year I don’t have to worry about spoilage any longer when we are without power for days in a row, like last year after Hurricane Irene in August and again after a foot of snow in late October. With the gardening season winding down, I have time for another fall project: the revised edition of Spoonfuls of Germany, my German regional cookbook (see my new blog). It’s funny though, as much as I welcome the upcoming downtime, I already find myself thinking about the elderberries that need to be moved in the spring, about which new crops I want to try next year, and how I can find a rhubarb forcer in the United States. As a gardener, even when you don’t stick your hands in the dirt, your head is somehow always in it. Two new tomato dishes I tried this year are definite keepers: Sarah Leah Chase’s Scalloped Tomatoes (with olive oil, not bacon; a food52 Genius recipe), and this Cherry Tomato Cobbler. There are several recipes for tomato cobbler recipes out there but they all call for all-purpose flour only. That would have tasted too much like a regular sweet cobbler to me, tomatoes need something more rustic so I used a mix of cornmeal and all-purpose flour for the topping. This is a great way to use all those not-so-pretty cherry and/or grape tomatoes, as well as the end-of-the-season runt right now. To avoid a soupy consistency, I added extra cornmeal to the tomatoes. 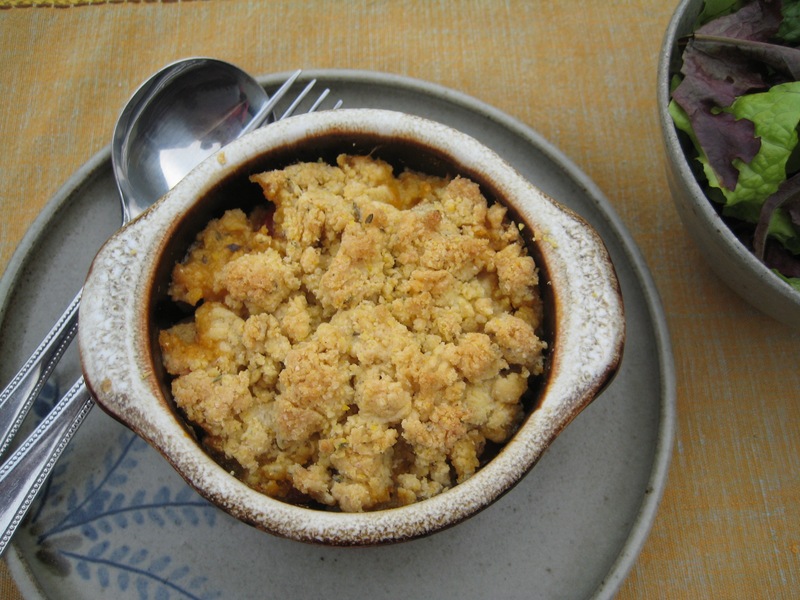 In the summer I made the cobbler in a large gratin dish but I thought it would be also nice to give everyone their individual serving dishes. I don’t own ramequins so I used ovenproof French onion soup bowls. They turned out to be perfect – shallow ramequins would have been too small. 1. Heat 2 tablespoons oil in a skillet and cook the onion until soft and starting to brown at the edges, about 10 minutes, stirring often. In the last 2 minutes, add the garlic and oregano. Remove from the heat and season with salt and pepper. Set aside to cool. 3. In a large bowl, combine the tomatoes, cooled onions with herbs, cornmeal, kosher salt and pepper. 4. For the cobbler topping mix flour, cornmeal, baking powder, and salt in a bowl. Work in the butter with a pastry cutter or with your fingertips. Once is has a crumbly consistently, add the cream and fold it in swiftly with a fork; do not overmix. 4. 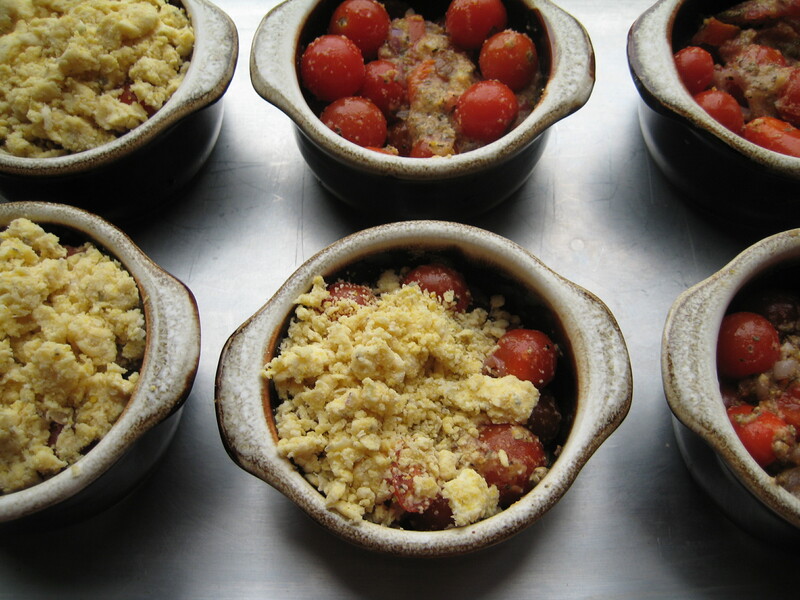 Divide the tomato filling among 6 ovenproof French onion soup bowls, or put it all in one large gratin dish. Top with the cornmeal crumbles. 5. If using individual serving dishes, place them on a jelly roll pan to catch any drips. Bake in the preheated oven for 40 to 45 minutes, until the tomatoes are bubbly and the tops golden brown. Serve hot or lukewarm. My garden was not as productive this year as I’d hoped, so I missed out on a great bit of the processing, which honestly was kind of nice, but I’m going to miss seeing those shelves of tomato sauce and bags of frozen roasted tomatoes and blanched greens. Enjoy!